Most people are aware that trans-fats are associated with heart disease risk, but their dangers go far beyond that…and ignorance is not bliss here. Compounding this problem is that many people are under the mistaken impression that a few trans-fats here and there can’t be all that bad…because nothing could be farther from the truth. Trans-fats are deadly in ANY dose. Trans-fats are not found anywhere in Nature. That should be your first clue that they're not good. 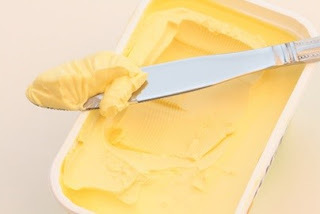 Trans-fats are created when food manufacturers infuse hydrogen into polyunsaturated oils to create a solid fatty substance (think shortening or margarine) with a long shelf life -- known as hydrogenated or partially hydrogenated oils. Hydrogenated and partially hydrogenated oils are found in countless packaged foods, especially snack cakes, cookies, peanut butter, chips and granola bars -- foods that are heavily marketed to kids. They're also in most bakery items, since bakeries rely heavily on shortening for cookies, cakes, pies and frostings. Trans-fats are dangerous to your health in a growing number of ways. They cling to your arteries and tissues, increase your blood cholesterol (especially your LDL “bad cholesterol”), contribute to the development of atherosclerosis, stir up inflammation and practically guarantee that you'll be making a call to your local cardiologist. In addition, since they're not from Nature, you don't have enzymes in your body that can break them down, so they're next to impossible for your body to eliminate. Plus, once in your body they can reproduce themselves by the billions. This spurs the development of free radicals, which accelerate atherosclerosis and inflammation, contribute to countless diseases and lead to premature aging. They’re affecting your BRAIN too! Researchers at the University of California-San Diego School of Medicine have observed in several different categories of people that consumption of trans-fats is associated with increased irritability and aggression. So these poisons are affecting our physical AND mental health! In addition, another study of working-age men showed that those who ate the most trans-fats performed the worst on memory tests. Think of them as being similar to anthrax—NO amount is safe. According to Dr. John Salerno of the Salerno Center for Complementary Medicine, even a small amount of trans-fats in your diet can increase your risk of heart disease. When your diet consists of real foods from Nature, trans-fats are not an issue. Strive to do the majority of your shopping in the outer perimeter of the store where the real foods are located—meats, poultry, fish, fruits, vegetables, dairy, eggs and real butter (never, EVER use margarine). Sadly, trans-fats have made their way into major brand-name supplements too! For example, one very popular multi-vitamin formula contains hydrogenated palm oil! And a good many others contain artificial dyes as well. When it comes to supplements, choose wisely and look for the highest quality. Like our very own line of Blue Rock Holistics™ supplements! You won’t find any hydrogenated oils, dyes or similar harmful ingredients in any of our fine formulas. Check out our selection of outstanding products—including our brand-new multi-vitamin formula Super Core! If you’ve been getting a fair amount of trans-fats in your diet for a while (be honest), chances are you may be fighting some of their inflammatory effects in your body already. But you can help ease existing inflammation by taking advantage of Nature’s anti-inflammatory--omega-3 essential fatty acids. And VitalMega-3 fish oil formula is the perfect choice. Just two VitalMega-3 capsules a day will give your body a helpful 1,000 mg dose of inflammation-fighting omega-3 essential fatty acids. The more you can eliminate the deadly poison of trans-fats from your diet (and your kids’ too) and counteract their harmful effects, the better your chances of strong physical and mental health…for life! In Great Taste No Pain, Sherry talks about good fats vs bad fats and which products she recommends for cooking. - Real butter and olive oil are the best choices for cooking. If you're concerned about the salt in butter, buy unsalted butter instead. Yup. Trans-fats are in there, regardless of what the label says. - Polyunsaturated oils (including canola oil, margarine, vegetable oil, grape seed oil, and corn oil) should never be used for cooking. As soon as your frying pan heats up, voila--you've got trans-fats. They are, however, fine for salads or for drizzling on foods after they are cooked (since the trans-fat aspect will not be cooked directly INTO the food). - Read food labels. If they mention hydrogenated or partially hydrogenated oils, do NOT buy the product. It's a box full of trans-fats. - Fast food restaurants typically fry their foods (including French fries and deep fried chicken or fish) in canola oil. This IS cooking to trans-fat. Benefits of Apple Cidar Vinegar with Mother? Having an acid pH in the body (acidosis) most definitely affects your body's ability to heal itself and to effectively use vitamins, minerals and supplements. Acidosis is a causing or contributing factor to a whole range of diseases and illnesses. So, apple cider vinegar, being alkaline in nature, helps regulate the body's pH levels, thus reducing acidosis-that's a fact. Therefore, it's not a stretch to associate apple cider vinegar with curing various illnesses. Great Taste No Pain goes into great detail about the effects of acidosis on the body, as well as provides a detailed guide of what foods are acidic or alkaline. It can help with digestion as well; many people who are lacking digestive enzymes find it helpful to take one or two teaspoons per meal. We recommend an internet search for more information. If you have questions about our products, please contact our support team at support@holisticblends.com.